Robert Gesink scored his second stage win in as many days, and his Rabobank team’s fourth out of five, in winning the fifth stage of the Tour of Oman on Saturday. Gesink consolidated his overall lead in the race, and now leads second-placed overall Edvald Boasson Hagen (Sky) by 1-13, with Farnese Vini’s Giovanni Visconti now third overall, at 1-19, after putting in an excellent ride against the clock to post the second best time of the day, 16 seconds slower than Gesink. Team Sky were left a little disappointed when a TV helicopter appeared to come a little too close to Boasson Hagen at the turnaround point of the 18.5km out-and-back course, and the Norwegian could only finish fifth, losing 29 seconds to Gesink. “Edvald rode a good time trial, but Gesink did a really good one, and showed he’s the best at this race,” said Sky directeur sportif Servais Knaven. “We’re still second in the GC, but without the helicopter coming so close, I think Edvald might have finished in the top three, as he was nearly standing still. Boasson Hagen certainly started the day as one of the favourites for the stage win, having won the corresponding stage on a similar course at last year’s Tour of Oman. 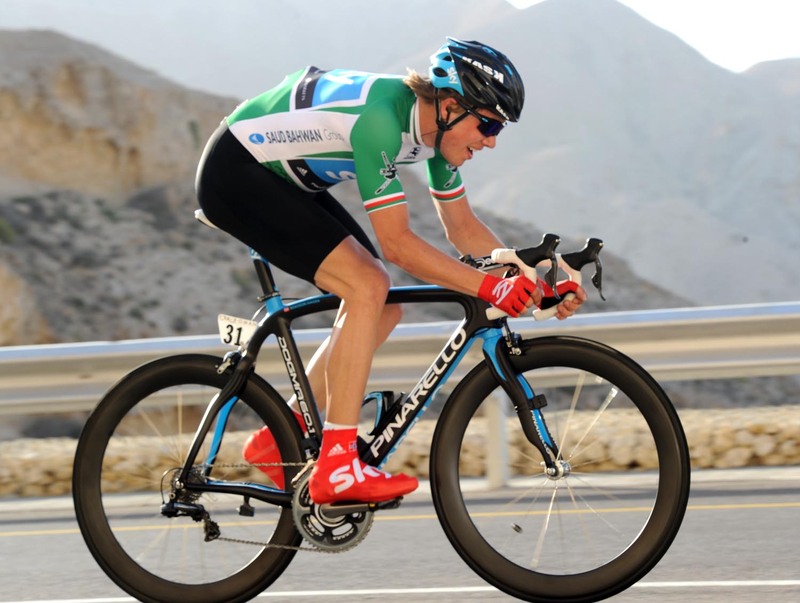 However, the result of this year bringing the riders back to the Al Jissah resort doubled the amount of climbing, which played into climber Gesink’s hands, and relegated time-trial world champion Fabian Cancellara (Leopard-Trek) to fourth place on the stage. Gesink’s overall victory should now be assured, with Sunday’s final stage consisting of 157 relatively flat kilometres, with the only difficulty being a tough climb at the start of the stage, where a break will be almost certain to get away. “If it’s a bunch sprint, then Edvald will try again for the stage win,” said Knaven, demonstrating just how versatile Boasson Hagen’s abilities are. “And you would expect a bunch sprint. But then with all this wind, you never know here.